Our team has spent the past few weeks summarizing 2017 as our company prepares for the New Year, which is already upon us! Bernick's always places a big emphasis on community; it's a pillar of our foundation (over 100 years strong). And there's more to our commitment and involvement than lending a few cases of water or soda to events. We're in the trenches in quite a few different areas: Give, Share, Care. Here's a snippet and visual representation of 2017 from our point of view. Giving means adding value to something or someone else. In our case, giving means more than monetary resources - we focus on where we can give our time and talents calling on the interest and expertise of our own team members. We're grateful to have such selfless, passionate people across every part of our company. The countless hours spent focusing time and energy into missions and causes helps us fortify the communities we serve. 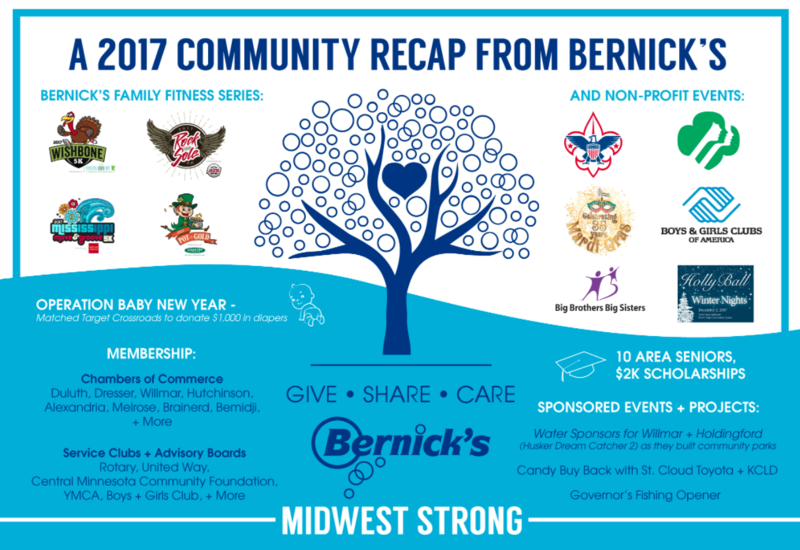 The Bernick's Family Fitness Series is a great example of sharing. This initiative, now in its eighth year, was about bringing the community together under the important subject matter of health and fitness. We wanted an opportunity to share the importance of activity and family time with others, and the idea of organized race events came to life. We're proud to partner with a host of local companies and organizations to bring affordable, accessible events to the community four times a year ... rain or shine! If I had to choose just one word to embody our team's culture, it would be caring. You can't have community as one of your company's core values without a fleet of caring, determined people behind it making it actionable. The Bernick's Family Foundation, for example, heavily relies on our team members to ensure we continue to honor the legacy of our company founders by upholding the tradition of supporting organizations consistent with the family's core values, while providing leadership in areas of emerging need.